In the beginning there was the word and the word said, “Let there be light,” and from the light all was created, including language. When God first created language, when you spoke the word, you manifested the meaning of the word. If you said “apple,” an apple appeared. This was the original power of the word. The power behind the word is the love, limitless power, and consciousness of God. Today the word is still the most powerful tool, aspect of humanity. Its power is somewhat hidden but nonetheless powerful. In order for manifestation to take place, it is now a four-step process: (1) a thought, (2) an emotion, (3) a spoken word, and (4) an action. The reason that it is now a four-step process to create rather than instantaneous is due to humanity’s disconnection from God/higher realms and our divinity. We have diminished our self-empowerment due to abuses of power in the past, but the good news is we are regaining it at this time. 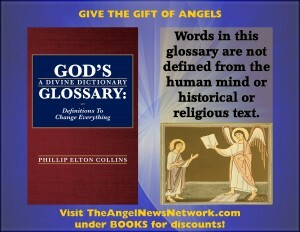 The words and short phrases in this glossary are not defined from the human mind or historical religious text. 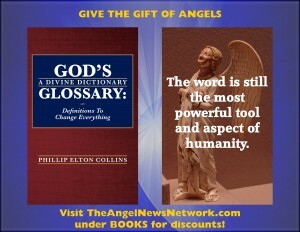 These definitions have been directly received from whence we all came, and through the publications within The Angel News Network Library Of Books, and by our metaphysical training and experience. The definitions in this dictionary are intended to retain your connection to their source and their original true energetic and spiritual truth. These definitions contain an energetic upload of wisdom to assist humanity in shifting to a higher state of consciousness, supporting the creation of another golden age. Some seemingly simple words are complex within themselves, but the definitions offered are intended to be brief and concise to ensure integration. Click Here To Purchase Paperbacks or E-Books!